This is an absolutely gorgeous 2 oz mint green fluorite, from Dal’negorsk, Russia, 1.6” by 1.5” by 1.1”. The color is absolutely luscious and yummy (enhanced a bit by a thin coat of golden healer), but put her under a black light and she will reward you with a light-show of intense electric florescent blue! She is rather domed with her fluorite in cascading, etched bubble-like cubes that give the look of exquisite crystalline flower petals! A bit of calcite to one side makes her look iced in that area. Check her with a loupe so you can fully appreciate her loveliness and savor her special energies – she is truly beautiful and ready to go to her special Keeper. Fluorites are the great "organizers". They allow you to put physical, emotional, intellectual and ethereal Chakras into alignment and balance. Green fluorite has a very special role in that it just pushes negativity away and the shift to blue allows you to avoid negativity in communication. This Spirit is incredible placed in a room where there will be others, to soothe, calm and energize the surroundings. She raises the room’s vibration and instills a state of Light and Love. I also like that she is a color-shifter, meaning her vibrations act on two levels – the heart and the Third Eye, allowing the critical balance between knowing what is in your heart and giving it expression. 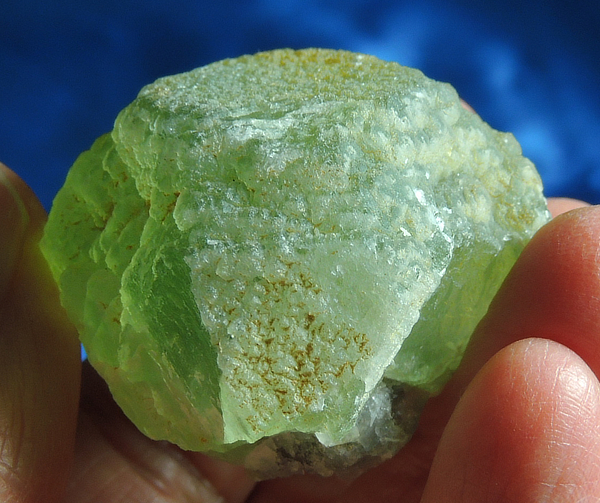 But, her role is much deeper than any of this – the Green Ray is wonderful for the heart and calcite for change and easing transition. This is a wonderful and beautiful cluster for helping you adjust to these hectic and change-filled times.